The wren is the commonest of the breeding birds in the UK but I suppose because they are also one of the smallest birds they can often be overlooked in the garden. They are a little dumpy bird with short wings and an upturned tail. 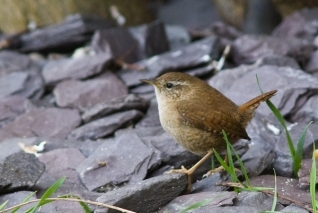 The wren has quite long legs and toes. They love to eat small insects and spiders. We have often watched the female wren feeding her babies on small insects. I was very surprised to see how many she could hold in her mouth at one time when she was collecting them to feed her youngsters. The baby was intent on her mum feeding her and every time she moved away the babe would cry very loudly and wait with mouth open for the next juicy morsel.